Home > Resources > Photos > Terrassa "Step by Step" Map, which displays different walking trips, showing the distances between 32 points of the city of Terrassa and the approximate travel time to connect them. The Terrassa City Council has launched a campaign which aims to encourage people to walk within the city by highlighting the benefits that this activity entails for citizens, especially with regard to health. The Deputy Mayor for the Environment and Sustainability, Marc Armengol, and the councillor of Health, Maruja Rambla, presented the campaign "Step by Step" last week at the downtown, with the slogan "In Terrassa, on foot. Fast and healthy”. This campaign offers the citizen a map which displays different walking trips, showing the distances between 32 points of the city and the approximate travel time to connect them. The campaign aims to make the map "Step by Step" a useful tool for citizens and an element that invites to reflection and the promotion of modal shift to get around in a more healthy, safe and sustainable way. The map also incorporates the main mobility elements and some points of interest and mobility generator points. Travel times are calculated based on an average speed of 4,5km/h. "Step by Step" is based on the original idea of metrominuto, an experience pioneered by the city of Pontevedra (Spain) and joined by others such as Paris, Toulouse, Cordoba or Vitoria, among others. In Terrassa, the 60% of trips within the city are covered on foot and the average distance per trip is 1.500 meters (which represents about 20 minutes walk), according to the survey carried out in 2014 in the context of the Urban Mobility Plan. The 31% of internal journeys are carried out in private vehicles, whose average distance is 2,000 m. This difference of 500 m between the average distances of walking and motorized private vehicle makes visible the existing potential for modal shift. The option for walking contributes not only to acquire healthy habits, but also improve the air quality in the city and reduce the effects of pollution on human health, through the reduction of CO2 and other gases and pollutants. In this regard, the World Health Organization (WHO) recommends 30 minutes of physical activity (such as walking at a good pace) at least five days a week, and to take advantage of daily trips is a good opportunity. 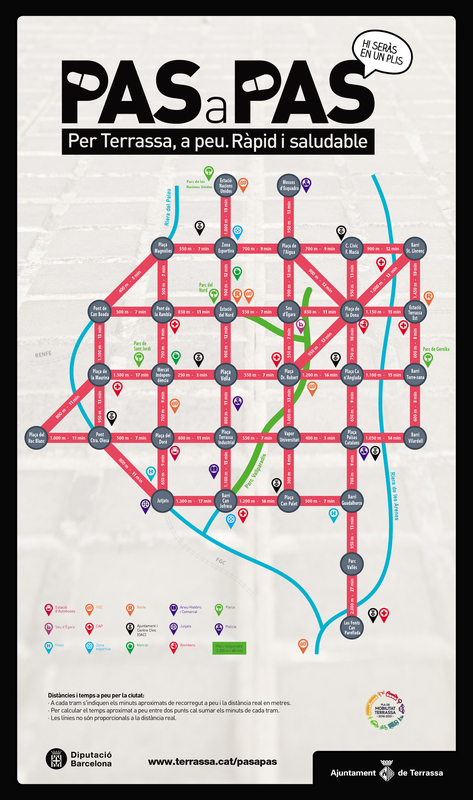 The Urban Mobility Plan 2016-2021 of Terrassa, which was initially approved in June 2016 and is expected to be definitively approved this month, sets the strategies and actions to be developed in the coming years to improve mobility in the city. Among them are the campaigns to promote walking. Moreover, the City of Terrassa, with the support of Services for Health and Community, has initiated an intersectoral project in the field of health in order to develop the Strategy for Health in All Policies promoted by the WHO. In this regard, the promotion of walking in the city is an action clearly transversal given that it contains common goals in many municipal services (mobility, health, environment ...). All information and campaign materials are available on the website www.terrassa.cat/pasapas. Brochures can be found in all municipal centers of the City (City Council, community centers, hospitals and health centers, etc. ).